Yesterday, 18 year old Abdella Tounisi, the latest terror sting victim of the FBI, was ordered released on bail by a U.S. Magistrate Court Judge. The Government immediately appealed to the District Court Judge who today reversed the Magistrate Court Judge. Tounisi will remain in custody. 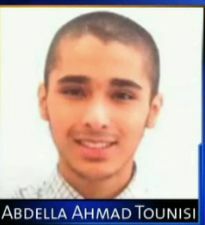 18 year old Abdella Tounisi is the latest terror sting victim of the FBI. He is a U.S. citizen and a college student. His parents are Jordanian. He's now in federal detention in Chicago charged with providing material support to a terrorist group. The material support he allegedly was willing to provide was personnel -- himself. He isn't charged with planning anything in the U.S. -- he had decided to go to Syria and fight with jihadists there. The FBI caught him by setting up a pretend Islamic terror recruiting website. He fell for the bait. During their online communications, Tounisi told the FBI he was very physically very small and had no fighting experience. He also told them he had no contacts in Syria. The FBI assured him his size didn't matter, they would train him, and then instructed him on how to make flight arrangements to Turkey. It even sent him a bus ticket for the next leg of his journey. He was arrested at O'Hare after checking in for his flight to Turkey.